What if she says, I have a boyfriend? If you’ve been out on the town for any length of time you are bound to have had the phrase muttered “I have a boyfriend” by some girl you’ve been talking to. I remember for many years this phrase used to be a game killer for me. Not only would I immediately retreat from the girl I was talking too, but with my confidence shattered, I would usually spend the rest of the night on the sidelines. There are several reasons why guys seem to get so affected by this phrase. The first reason is that they immediately equate the phrase with some form of rejection. The second reason is that guys feel like they are wasting their time talking to a woman in a relationship. And the third reason we tend to hate this phrase so much is because we feel a tinge of guilt for hitting on another man’s woman. It wasn’t until I began to have close relationships with several female friends that I began to see the fallacy in all three of these reasons. It was through my many conversations with them, along with my observations of the way they acted towards the various men that were approaching them, that I began to really understand the misguided power that phrase contains. Let’s first examine the three REAL reasons a woman will tell you that she has a boyfriend. She wants you to go away. She is starting to feel attraction towards you and wants to break the state. She is letting you know that if you proceed there must be discretion. Here is a fact that you are going to have to come to grips with. The fact is, at any given time, almost every attractive woman has at least one guy she is currently involved with. The level of intensity of the relationship will vary from woman to woman… but you can be sure that there is at least one other guy in the picture at the moment. So you are almost always being judged against another guy. Let’s get something else straight. Just because a woman has a boyfriend does not mean you are forbidden to talk to her. While I do not advocate actively trying to steal other men’s girlfriends, there is no guarantee that the woman is in a happy relationship, or she isn’t already looking for a reason to end it. And there is also no rule that says two human beings can’t have a genuinely fun and exciting conversation just because one of them is currently in a relationship. Yes, many women use the “I have a boyfriend” line as a way to get rid of guys that are annoying them or they have no sexual interest in. If you hear this line extremely early into a conversation than you basically have two choices. Continue the interaction and attempt to build attraction. If your game is not that solid then your best option is probably to bounce. At this point whether she really has a boyfriend is irrelevant… but she has let you know that her guard is up. Although your ego might be tempted to try to win her over, or erase the rejection, just accept the fact that there are probably easier and more entertaining women available to approach. At that point, you would want to break the silent tension and move forward with some fun banter. Ignore the whole “boyfriend” thread for the rest of the night and continue to proceed forward as if it was never said. 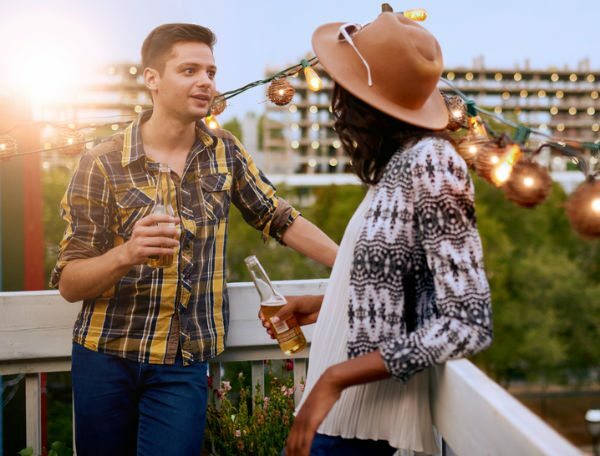 If you are hearing “I have a boyfriend ” for the first time later in the conversation as both of you seem to be enjoying yourselves, she is saying it as a way to break her state and control the attraction she is feeling toward you. Whether she does or doesn’t actually have one at this point is irrelevant. She is saying it as a way to kill the momentum that you’ve created. She is addressing a logical concern. You can NOT respond logically back to her. If you do, the two of you will get into a logical conversation and all the emotions that have been created will disappear. So at this point I would proceed as if it was a test. She wants to see if she can throw your game off. Don’t let her. Just slow down the escalation for a few minutes, ignoring the comment, and continue building attraction. After a few minutes, amp up the escalation again and see how she reacts. So if things are getting hot and heavy and she lets it slip out… put your finger up to your lips and say “your secret is safe with me” and proceed as planned. If you are actively socializing in bars and clubs you are bound to run into this phrase quite often. You need to be aware in advance how you are going to respond to it. Even if you are dead set against being a “home wrecker” there are plenty of good reasons to continue talking to a woman who has told you this. First, the act of talking to her may be acting as social proof to other woman in the bar… if you abort too early it may come off as obvious to other’s in the room you were shot down. Second, you may find that you get along well with her and can weasel your way into her social scene to hit on her friends. And third, if you do sense attraction you can plant some seeds through Facebook and see what happens over time. Homepage Dating Pick Up Skills What if she says, I have a boyfriend?